The summer day started out beautifully. It was sunny with a light breeze, a perfect day for my oldest son of 7 years old to play outside with the neighbor boys who, while each a few years older than him, had become his best friends. As the day went on, the dark clouds slowly started to come in and before we knew it, it started to rain. The boys each ran inside to their own houses and my son, frustrated, stood looking outside the window. What he said next, I never expected. Thankfully what happened in that moment is something that I feel every parent should know and be reminded of. While I make a lot of mistakes in my parenting, I feel that this is one thing that I tend to do OK with and have continued to keep in the forefront of my mind at all times. I made my way over to him, knelt down on his level, and looked him in the eyes. I could tell that he wasn’t quite sure if this was a word he should be using or not and explained that he learned it from the neighbors. Quite possibly right before he came inside. While keeping a calm spirit and using a loving tone to my voice, I went on to teach him why that particular word is not one that we use and reassured him that he was not in trouble because he didn’t know. However, now that he did, the next time I heard it there would be a consequence. If only parenting could always be that easy and there have been many times when I wish the problem I was dealing with was needing to teach them about the use of an inappropriate word. As time has gone on and the boys have gotten older, they share things, sometimes through their tears, that can break my heart and the mamma bear in me rises up and just wants to scream out. 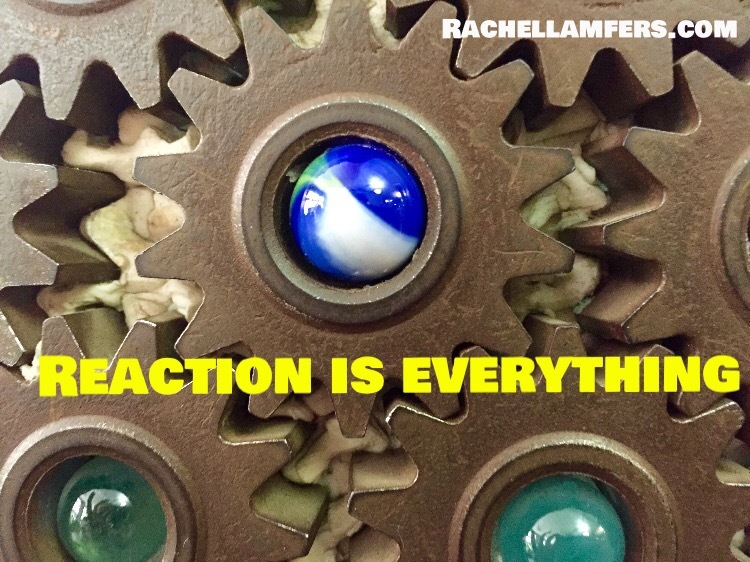 Friends, our kids are going to do things, say things, and tell us things that will cause our insides to want to explode out of anger, frustration, or hurt. It is at those moments, when being in control of our emotions and reactions is of upmost importance. What I have discovered over the years is that how I have reacted in the tough moments has dictated the kind of relationship that I now have with my boys. By reacting in a way that is non-threatening, a trust has formed. I have been completely shocked by what my oldest, now almost 13 years old, will share with me that I know without a doubt would never happen if he didn’t trust my reaction. We need to let our children know that our home is a safe place to open up and share. Having that close trust and relationship with your child will also help you guide them in a way that is effective. After all, who can positively respond and learn by an out of control parent? When it comes down to it, isn’t that what we all have to remember? Maybe the dark clouds of life suddenly came in, took you by surprise, and ruined your bright sunny day. We may cuss, scream, get angry, and want answers, fight, make mistakes, get hurt, and cry out, but we always have a Father who continues to love us despite our circumstances and the way we react to them. While some of life’s lessons are tough, especially the ones that you learn through the hurts of your own children, I am thankful for the Word in which we can be taught and reminded on how to follow His example. He is always there in complete control of His reaction; ready to listen to whatever we might have to say. The next time you, child of God, need a trusting place to share your feelings; you can always go to Him, your Father. After all, that is the best place to be.